The Houston Texans are celebrating their seventh straight win after defeating the leader of the NFC East (a team that hails from the metropolitan area of Washington and has a whole-ly problematic name) 23 – 21. The Texans remain 1st in the AFC South with a 7 – 3 record. If the Texans continue on this path, a run in the playoff isn’t that far-fetched of an idea. A lot of things are working, however, there are still some areas that could be tightened up. The “just enough” Coach O’Brien may have been referring to was Quarterback Deshaun limiting his costly interceptions to two. Perhaps this was a tougher pill to swallow considering O’Brien had stressed the importance of limited turnovers earlier this week. 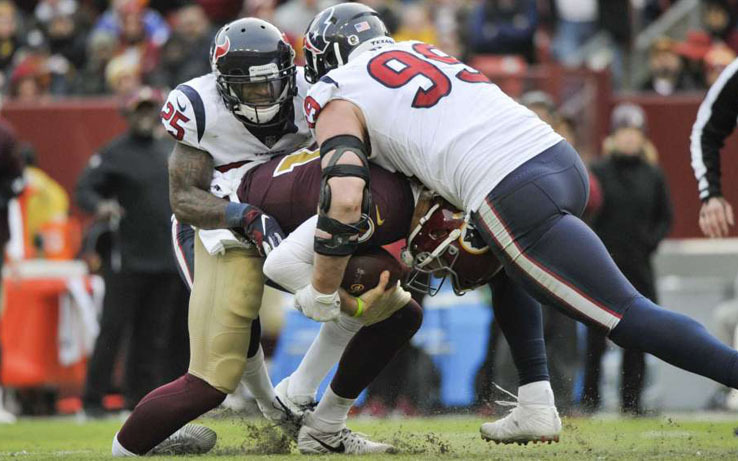 In addition to two interceptions, Watson managed to complete 16 of 24 passes for a total of 208 yards and produced a single touchdown pass to DeAndre Hopkins. Defense held the team down this week with a number of interceptions that were returned for points on the board. Just in case there is any confusion as to what the team is focusing on, defensive end Jadeveon Clowney made it clear that the most important thing week to week is getting the win. The Texans will face the Tennessee Titans at home Monday November 26, 2018.